From the first introduction of detachable magazines on firearms, people have been looking for ways to increase magazine capacity. Whether it is drum mags, longer box mags, jungle clips to connect multiple mags together, or other gimmicks, more ammo is always the goal. Well, the German army took a rather unusual approach to this issue in 1942, when it introduced an experimental double-magazine version of the MP40. If one mag is good, two must be better – right? The gun was intended for special operations troops who were judged to have a particularly pressing need for more ammo on hand to deal with ambushes and high-intensity close range firefights. The design used a completely stock MP40 and replaced the magazine housing with a redesigned one which held two magazines side by side. The pair of magazine wells was a sliding unit that could move left and right under the receiver. Once one magazine was emptied, the shooter would just press a latch on the front of the housing and slide the unit laterally and inch or so, positioning the second loaded magazine in the path of the bolt. 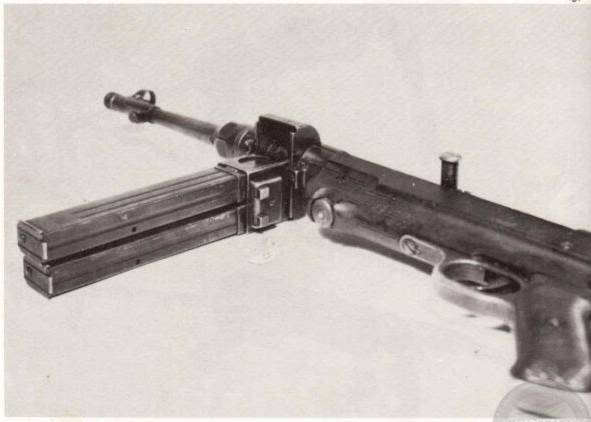 The bolt would still have to be pulled back manually before firing, but given the use of military-style magazine pouches this was still definitely faster than reloading a standard MP40. Official doctrine called for troops to slide the new mag into place when the first was empty, and then replace the empty mag with a full one, so a spare loaded mag was always available in reserve. This allowed the gun to be loaded and ready in case one was surprised while reloading, but only in extreme cases were both mags to be emptied in the gun. 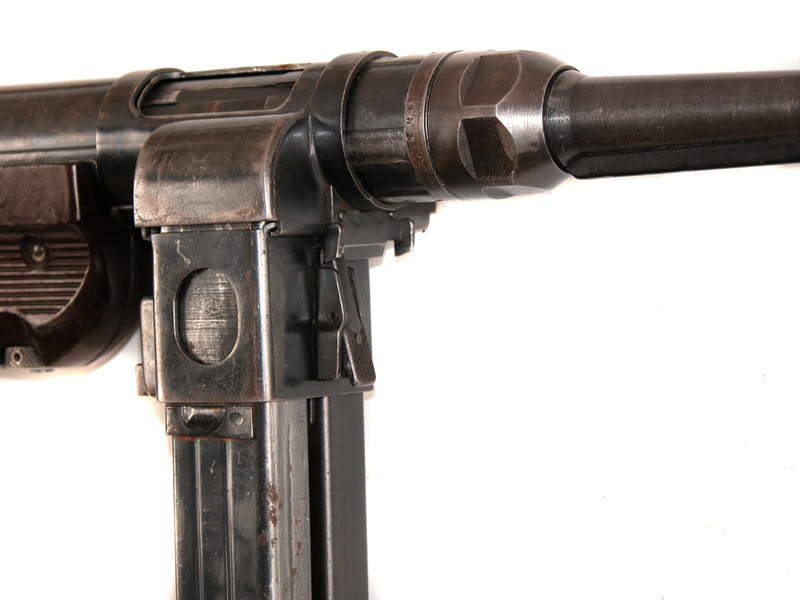 Note the lever on the front of the mag housings, which allowed the unit to slide left and right. On the plus side, this system could be made with minimal changes to MP40 production, and it used any standard MP40 magazines. However, it had a number of downsides (as do most all really high capacity adaptations). First, as always, weight was an issue. With two loaded magazines, the gun weighed in at just over 12 pounds, and much of that was up front making the gun awkward to handle. The sliding mechanism was also vulnerable to jamming from dirt or grime in a way that would never happen to a normal MP40. Ultimately (and fairly quickly), the experiment with this variation of the MP40 was cancelled. 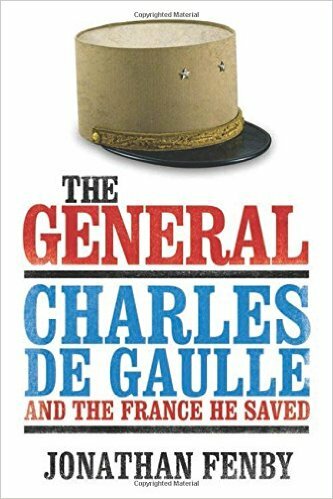 It simply didn’t offer enough advantages over normal guns in the army’s view. Very few survived the war, although it seems likely that counterfeits have been made, as the guns command extremely inflated prices compared to normal MP40s, and the modification is comparatively easy to do (I have heard that a few dual-mag housings were brought over to the US from Czechoslovakia or Yugoslavia after the war, which would make it very easy to make one of these). The original ones were made by Erma and Steyr (manufacturing codes ayf and bnz respectively) in 1943. Another view of the Belgian Army Museum example – note the two magazine release buttons on the back of the mag housing. These guns are generally referred to as “MP40/II”, but this nomenclature is incorrect. In official Wehrmacht equipment lists, they are called MP40/I. 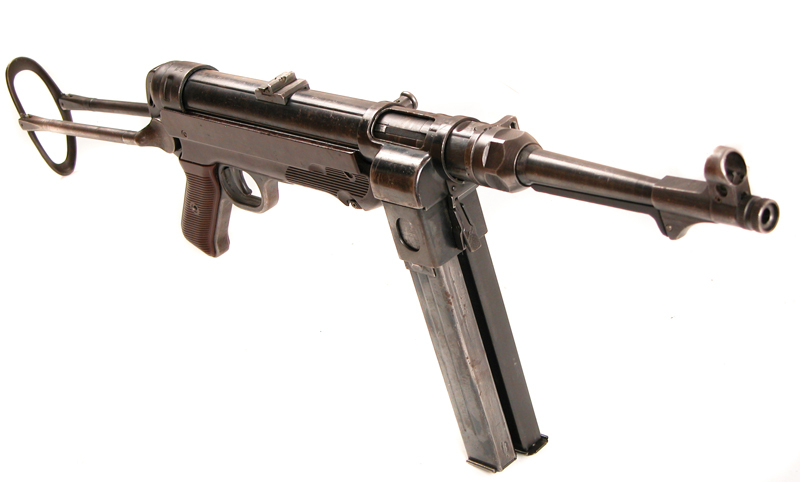 There were changes made to the standard MP40 early in its production (new bolt handle design and ribbed mag housing), but these changes were never given a new designation. So the first major variant of the design was this dual-mag system, hence it was called the MP40/I. Ok this is gonna sound weird (and nerdy): but years ago i played a pc game called silent storm, turn based WWII fantasy shooter. All kinds of weird weapons in there.and way to much gun models for a game, 5 different sten variations for example. Some of them i considered completely fiction like a 1911 that fires darts or grenades. (previously featured on this site). I also thought they messed up the guns that sounded believable, they had some weird MP40/1 named mp40’s that had 64 rounds of ammo instead of the normal 32. The game was made by a small russian/german studio, apparently there was a gun buff there. Russian game developers are gun nuts by default, I think. There were already many Russian and Ukrainian games that contained odd, but real guns nobody bothered to include in many Western games. IIRC another reason for this Heath Robinson contraption were the continuing feeding problems from the double-stack/double-feed magazines even after the 1941 mods. Some (Mauser?) mathmatician even wrote a scholarly treatise on the geometry and force/friction distribution in the mag. Turned out to be quite trivial: oily maintenance (as per manual and training) plus Russian/North African dust equals stoppage. Grabbing the weapon by the mag instead by the fore-end (as per regulation and training) confounded the feeding troubles. Do you mean “Double stack/single feed” magazines? Addendum: ‘mathematician’, and my sincerest apologies to the numbercrunchers. Loadsa pictorial evidence that German soldiers carried in battle the Shpagina/PPS41 and the Tokarew/SWT 40 (another candidate for the Great Rifle Pantheon). Seems that with them the grass was greener on the others’ hill. Loadsa pictorial evidence that German soldiers carried in battle the Shpagina/PPS41 and the Tokarew/SWT 40 (another candidate for the Great Rifle Pantheon) and Soviet troopers with the MP40. Seems that even for them the grass was greener on the others’ hill. It was SOP to tape two M1 carbine magazines or M3(grease gun) mags while in the field; back in my day. It was only done with the magazines on the weapon and not on our reserves. The Germans always seem to complicate something that is easily done with a length of tape. Och Andrew, you are so right with your comment. Nobody has ever seen K31 or StuG57 in combat use. Maybe they could have made the dual feed type magazine, like the 50 rounders they make for the AR15? Notice no troops in Afghan use this mag, (these mags probably vetoed by higher ups.) That’s the only solution and they never thought of it and tried it. Taping mags together, sure, but the mag of the MP40 was already far too long for ease of use. Soldiers with sub guns need to get in close and get prone or they become dead soldiers. This means the extra mag is getting jammed in dirt and mud, and the soldier has to expose more of his person – easy target, get him! Slamming in a muddy spare mag into the weapon, instant jam…some type of cover to keep dirt out of the mag defeats the purpose as you waste time discarding it. Not to mention taping two mags together would be like carrying a broomstick attached to your weapon…perhaps these were the reasons they did not try taping two mags of the MP40 much if at all? What do you think…The amazing thing was, as hell bent as Hitler and Stalin were on conquest, neither one deigned to equip their troops with the superior firepower of a semi auto rifle but kept the 40 year old bolt gun! “Wasting ammo” or some such crap, old generals are always full of shet and no doubt, lost many a battle, by poor weapons choice they severely under-utilized their core means of projecting combat power: the lone infantryman! If one looks around you’ll find plenty of pictures of Russians(and other UN soldiers) using German weapons. I think at axis history forum there is one of a Russian with a MP40. I think that in every army there is a certain % that believe that the enemy has better weapons. I like to contrast 2 of my cousins that were both in Vietnam at the same time. One said he only used his M16 when forced to & instead loved the AK47. The other, who basically saw fighting daily for his 1st nine months, said he sure was glad that he had a M16 and the Communist were stuck with the AK47. It’s often difficult to deduce just how often soldiers used enemy weapons by just one or two photos. You never know the context in which the photo was taken. It could’ve been of a guy posing for the folks at home, cleaning up after the battle, etc. I’d also imagine with all the close combat of the Eastern Front, many a Soviet infantryman started with a M-N bolt action but quickly ditched it for something faster firing and easier to handle for the duration of that fight. Then he went back to his issued weapon. Don’t want to have the Political Officer notice your Fascist weapon! Indeed it is if going just by the pictures. But I’ve talked to enough vets back home that served on the Eastern Front to know that it is true that not every Russian was issued a weapon when they attacked a German position. The 1st wave almost none had one. And they would pick anything to use as a weapon including a big stick. Even a Mauser has more power power than that. Using captured weapons was in fact encouraged by the zampolits (zamyestityel po politicheskim dyelam – ‘exec for political matters’ as the commissars were really called) and there was a series of widely distributed booklets containg manuals for captured weapons, mostly small arms and low-key artillery, but also including a manual about the Panther tank as well. There was a whole policy by the Soviet military and state high brass, called Bey vraga yego sobstvyennom oruzhyem – Combat the enemy with his own weapons. You can find 100s of photos showing Soviet soldiers with Polish, Finnish, Japanese or German weapons, sometime even “compound-captured” as a photo of a Red Army private with Italian Carcano carbine on guard duty in Germany – not at Stalingrad where he could capture it from the Italians. That’s quite interesting, I wouldn’t expect that kind of reaction by the tactical level Zampolit. I can see it at the higher levels, though. Necessity being the overriding concern when Soviet arms were in such short supply for at least the first couple of years. This system or a similar one was used on the EMP44. Does anyone know if it was the same or was it a different design? Nope, drums were not designed for the MP40, nor were Suomi mags adapted to it. In fact, when German forces captured PPShs, the official policy was to convert them to use 9mm ammo and MP40 stick mags. Obviously plenty were simply used as-is by German troops, but if they got back to a depot they would be converted. Also, there may well have been some experimentation by individual gun owners or gunsmiths in the decades after WWII to create MP40 drums. So you might find a one-off converted drum out there that someone put together. But not a military-made type. On the subject of the Suomi drum, has anyone else ever noticed the internal similarities between the Suomi drum and the Luger’s Trommel magazine? I have never seen it in anything I have ever read. Everyone is always either praising Aimo Lahti for his “originality” and “creativity”, or (in the case of Hogg) proposing that he copied the Thompson drum design, which is preposterous. The MP 18 used the snail drum magazine; it was unreliable. The Suomi drum was the base for the PPSh 41 drum.The Suomi drum was both reliable and interchangeable. PPSH 41 Mags were not interchangeable and were replaced by box magazines during the war.Drums were and still are used with the PPSH 41 where ever they may be found.Thompson drums are difficult to insert quickly and were replaced by box magazines during the war. Today the Squad Auto version of the AK 47 & AK 74 use drums that are far from perfect. Most users prefer the 40 to 45 round box magazines. The “C” mags for the AR 15 need special lubes and are prone to jamming and breakage.New ones are better but need to be battle proven. The drum magazines are a great idea that just do not work as well as one would anticipate. One exception is the MG 15 saddle drum mag that while a bear to load is very reliable. do you know why the MG 15 saddle drum mags are very reliable and others are not ? Probably because they are heavy in construction; they have dual drive springs that are also very heavy and well designed. They had a machine that compressed the springs in sequence as fresh rounds are loaded. These are very high quality and carefully made. While I agree that the magazine sliding mechanism would have been a liability in general battlefield environments, I can’t help but think that it might have actually worked in an urban warfare scenario, which tends to be somewhat “cleaner” ( it’s all relative, mind you ) from the standpoint of potential ingestion of dirt, sand, dust, mud and other debris. However, the extra weight forward of the center of balance and its impact on handling would have negated this feature in the overall performance equation. Still, it is a very interesting attempt at increasing immediately-available firepower for the end user. It always drove me crazy as a platoon commander to see Marines taping mag together. That bottom mag will be filled with dirt once you go prone (trust me you want to be prone when the shooting starts). Solutions that increase mag capacity while keeping magazines upright always make more sense. I wonder if the Germans figured out like us that it is better to practice mag changes. you are not supposed to tape the second mag upsidedown on the other. you tape them side by side with an empty case between them so they form a V shape and the other magasine fits outside the magazine well. In Medal of Honor Airborne you could win this set up as an upgrade to the MP40. The ready-mag of the 1940’s! Firstly the EMP44 dual mag system is compleatly different to that of the MP40/1 and a much better design. There is one in the backroom of APG museum in Maryland. Secondly concerning MG15 drums my experience is that there is a stronger spring for use in the MG15 than in the MG34. If you put a Luftwaffe drum mag on the MG34 top cover the boltspring is not strong enough to push the rounds out of the drums when they are fully loaded. Re MG 15 magazines they are not intended for any other weapon. The MG34 conversion was a last ditch thing that should have worked in theory. You are correct that the MG 15 has a very strong spring. It fires at a very high cyclic rate and the balance between the magazine feed and the cyclic spring was carefully calculated. Later in WW2 MG15s were replaced by MG 81. The MG 15 was modified by various arsenals for ground use.They were reliable but fired way too fast.The model with the water jacket was heavier and was more stable.It is believed that MG 13 magazines were also used on the ground mount but that is not accurate. Actually Andrew, the MG34 had its own double drums from the beginning. They were intended for use in the AA role so that you had a higher rate of fire (because the gun did not have to lift the belt in feeding) and you did not have the non-disintegrating belt flapping around and possibly getting tangled. Later it was found to be unnecessary and dropped. The drum that attaches to the side of an MG34 is not a magazine. It is simply a belt carrier. 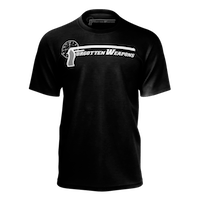 It does not have any sort of mechanism inside to advance the ammunition to the feed aperture for feeding into the gun like a proper magazine. The belt drums were for use in the light machine gun role to protect the rounds in the belt and keep them from getting out of order or dirty before they got fed. As for the noise factor, it is rather like the myth of the Garand ping. There is such a cacophony of noise on any given battlefield that something like ammo rattling in a belt carrier is rather inconsequential. As for why MG15 mags have disappeared from the market, I am hardly an insider when it comes to those kinds of matters. I just study the history of these things a bit more intently than the average person. Maybe people are making high-capacity magazines for their G43s or Hakims, just pure speculation on my part. I wander how many of these things were made? Typical German lack of common sense.